Summary BROKEN HORSES is a US crime thriller in which two brothers find themselves embroiled in a gang war on the Texas border between the USA and Mexico. 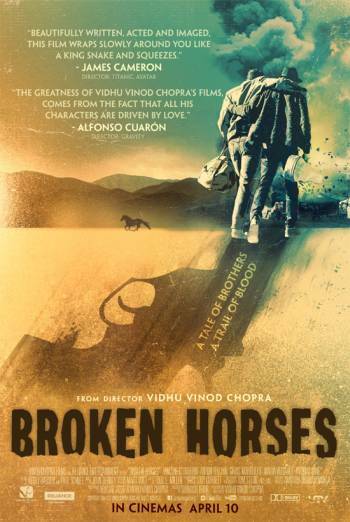 BROKEN HORSES is a US crime thriller in which two brothers find themselves embroiled in a gang war on the Texas border between the USA and Mexico. Violence and associated injury detail includes several scenes of shootings. A montage of images of men who have been shot and killed includes sight of blood on faces and bullet holes in heads. In another scene a man is subjected to a savage beating. Although the impacts are generally below frame, blood sprays up onto the assailant's face and shirt.